Would You Risk Looking Like An Idiot Who Can't Tell The Time for These Pretty Watches? 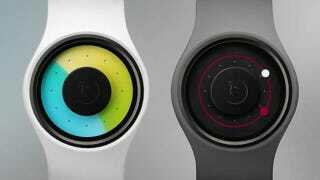 Yes, watchmaker Ziiiro has come out with other neat, futuristic watch designs before. And it's true that you may never get used to their quirky method of telling the time. In fact, it'll most likely get you squinting and peering at the accessory for an extended period, causing your friend with the innocent "Hey man, what's the time?" question to doubt your mental capacity. In case this happens, just flash your Ziiiro Aurora- or Ziiiro Orbit-adorned wrist to make him shut up. Self-importantly state how The Aurora uses two different colors that fill up from 0% to 100% to tell the time: The blue gradient acts as the hour indicator, while the yellow gradient acts as the minute indicator—and these overlap to create a mix of shades that change throughout the day. Or if you've got The Orbit, smugly explain how the red dot indicates the hour, while the white dot shows you what minute of the day it is.